When I told my family, they were shocked. My cousins mocked me, and I knew then that none of them would probably ever understand. I’m talking, of course, about the first time my family realized the full level of my nerdiness. I was at a family cookout, attempting to explain Reddit, how it worked, and why I loved it so much. I then mentioned that there was an awesome web design conference that I had my eyes on. For the record, I know they are only kidding. Growing up in a large, very tight-knit family has given me three very important gifts: infinite love and support, a self-deprecating sense of humor, and very thick skin. But for this article my target audience is not my loud, crazy, Irish-Cuban family, it’s you! I’m writing today for all of those who love design of all sorts, love what they do as a profession, and want to advance their skills by attending a conference. After reading this article, I’m confident that you’ll have all the reasons in the world to convince your boss to send you to the conference of your choice. Your boss needs to understand that behind-the-desk-time is not directly equivalent to productive-time. There are some skills that you can gain at a conference that you simply cannot gain within the office. If your employer shrugs off your request to visit an industry-related conference, remind him or her that this is not a completely selfish appeal. You aren’t asking to go on a week-long vacation, or for a new iPad, or a salary increase, you’re asking for your employer to invest in you as an employee. In a tech-related industry, we hardly have the opportunity to catch our breath. Just as soon as we master our craft, something new is introduced and we have to adapt all over again. 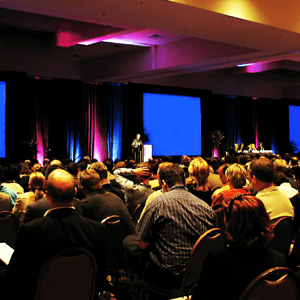 Conferences are all about new ideas and techniques, and can help you gain an edge over your competition. Recently, Optimum7 has begun scheduling and carrying out weekly creative meetings. This is something we’ve always wanted to do, but unfortunately, there just seems to never be enough hours in each day. Realizing that time isn’t going to slow down for us any time soon, we’ve made it a priority and are really sticking with it. I’m telling you this because it is simply magical what happens during those weekly creative meetings. The ideas trip over each other one after another. Everyone participates by pitching new concepts and voicing possible concerns. We are a group of less than 10 people. Can you imagine the ideas a large group might come up with? A conference is an excellent place for inspiration. What could possibly be closer to the center than a conference designed specifically for your industry? In addition, once you hear these ideas, you become a “carrier.” Upon returning to work, you’ll likely be brimming with concepts to share with your team. They will accept the ideas, spread them, and so on and so forth. By sending a single employee to a conference, you’ve successfully revitalized creativity for your entire team. While we do live in a predominantly electronic world of tweets and emails, nothing can really compare to face-to-face interaction. At a conference, you’ll have the opportunity to meet and interact with heads of your industry, bounce ideas off of them, and perhaps even swap business cards. If you’ve read any of the articles here before, you know that authority is one of the most important aspects of online marketing. Next time you visit a website, briefly search for logos or awards that help to establish the site’s authority. In addition to logos and awards, some sites also post updates about recent conferences they’ve attended. By attending these conferences, and promoting your attendance, you increase authority and demonstrate your dedication to staying current. This past Monday was tax day, now is a better time than ever to remind them that they can increase their chances of a refund by sending you to a conference! Because conferences can be considered an educational expense taken to improve professional skills, the conference, airfare, lodging, and meals can sometimes be considered tax deductible. Here at Optimum7 we’re always looking for new, exciting topics to write about in our weekly articles. Attending the conference will give you inspiration, insight, and plenty of new article topics. Perhaps you could even write a few while still at the conference. Is there a speaker or session you’re particularly looking forward to? Try to connect with them ahead of time- perhaps you could squeeze in a quick interview or a quote. At the very least, you’ll have the opportunity to listen to what they have to say and you’re very likely to think of topics from their lecture. So Which Conference Will I Be Attending? Aha! Good question! I’ve actually been in communication with my boss for several months now about An Event Apart. To be quite honest, it did not take much convincing – here at Optimum7 we are fortunate enough to work with a team that fully understands the importance of furthering our skills and authority. So, there is no doubt that we will be attending, the only question is when. An Event Apart will host six conferences throughout the US this year, and at the moment we are leaning toward either San Diego or Boston. I surely hope to see all of you there, complete with success stories on how you were able to convince your boss to send you with a little help from this post! Are you looking for a designer who is dedicated to staying current on the latest trends in order to best serve your company? Contact Optimum7 today!